Picture nearly 200 students crammed into Nordy’s Place singing along to Nikki Minaj’s “The Night Is Still Young” and cheering wildly for a drag queen sporting a wild blonde wig and denim jacket. 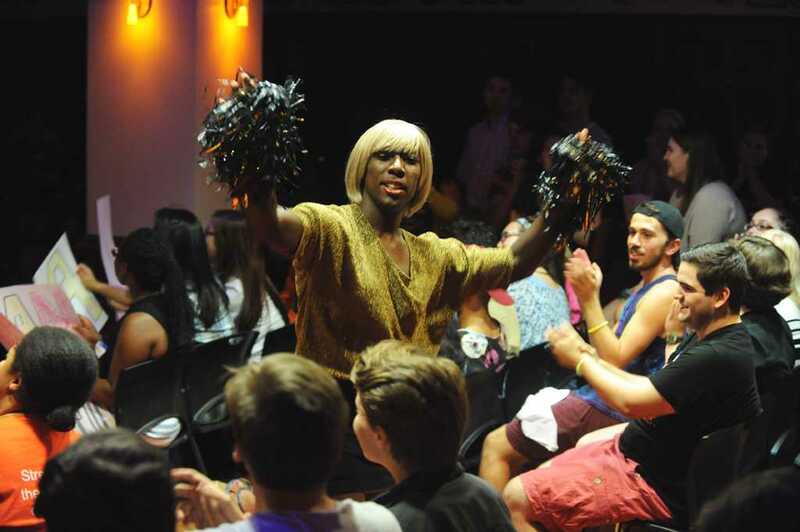 That was the scene Thursday night at one of the Rainbow Alliance’s first events of the year, an interactive drag show designed to introduce first-year students to drag performance in a fun and intimate way. Audience members joined the night’s scheduled performers in singing and dancing on stage to raise awareness for the Rainbow Alliance’s LGBTQIA-inclusive initiative. Each April, the Rainbow Alliance holds a larger drag show in the William Pitt Union ballroom with professional drag performers to raise money for various LGBTQIA advocacy organizations. This amateur drag show, whose participants were exclusively students, was the first of its kind for Rainbow. All attendees wore a nametag throughout the night, which included their preferred pronouns. The pronoun nametags highlighted the theme of education about Queer culture which pervaded the evening. “We hope this serves as a first step for students to get experience with parts of the LGBTQIA community and to become allies and more involved with organizations such as Rainbow which advocate for greater tolerance,” Robinson said. As paint-bearded sophomore Bridget Duffy and junior Ben Zwang, the night’s MC’s, introduced each performer, they also announced their preferred pronouns. Audience participants also announced their names and preferred pronouns as they climbed onto the stage. Though the audience’s applause determined the night’s “winners,” competition didn’t appear to play a part in the show. Freshman Gina Boito, who was plucked from the audience to perform, was a crowd favorite who sang Taylor Swift’s “Shake It Off” with total commitment. She sported a beard that was put on with face paint before the event began in homage to “drag kings,” or women who perform in male dress. Boito, who had never been to a drag show before, said the electric atmosphere made the event memorable and a reason to go to future drag shows. As the night came to a close, audience members like freshman Julie Kenneson are already looking forward to April’s show. “I had a great time and will definitely try to go the one in April,” Kenneson said.